In the mid-afternoon of July 23, 1991, a powerful earthquake struck the town of Maca, in Peru's postcard-perfect Colca Valley. Relatively few people lost their lives—most residents were tending the terraced fields nearby—but much of Maca was leveled. Part of the roof of its landmark 17th-century church caved in, and one of the twin bell towers partially collapsed. "The bell ended up on the ground," remembers Juana Cayllahua, who was born in Maca some six decades ago. "It was very sad. I've been coming to my church since I was a little girl." Following the earthquake, she recalls, some people even talked about dismantling the Iglesia de Santa Ana de Maca and selling off the pieces. "We thought, we're never going to be able to replace it." That drastic solution turned out not to be necessary. Thanks to an extensive, long-term restoration program run by the Spanish Agency for International Development Cooperation (AECID for its Spanish acronym), Juana Cayllahua and her husband, Miguel Chiuche, are able to pray in a church that has been fully restored. The Maca church (top) was heavily damaged in an earthquake in 1991. In Yanque (middle), it's the close-up view of the facade that's most distinctive, while the bell towers of the massive Lari church are visible from miles away. Whether or not their pews are filled, the Spanish colonial-era churches that anchor Maca and other villages and towns throughout the valley are attracting a growing number of visitors. Located against a backdrop of snowcapped volcanoes, about 100 miles north of Arequipa, the area has seen a steady increase in both national and international tourism. According to AUTOCOLCA, the regional tourism agency, the total number of annual visitors rose by more than 150 percent between 2003 and 2010, to nearly 170,000. The Spanish first arrived in this region around 1535 and began to mine silver, gold, copper, and zinc for the Spanish Crown. They were accompanied by Franciscan priests, who began to evangelize the local populace and build chapels, then large churches. A stone chapel in Coporaque dates back to 1565. The Colca Valley churches were built over a period of some 200 years, beginning in the late 16th century. They reflect different architectural styles, most of them variations on what is known as "mestizo-baroque"—a less opulent version of the edifices being built at the time in Europe. The building material of choice in the Colca Valley was sillar, the same type of volcanic stone that gives Arequipa its fame as the White City. AECID has been working to restore 14 of these churches. AECID did its first studies of the Colca Valley churches following the 1991 Maca earthquake and began the restoration project a few years later. Juan Carlos Cavero Catalán, a Peruvian restorer who coordinates the agency's efforts to restore the churches' art objects, says the project provided a way to promote education, culture, and rural economic development. "The valley was considered an area of extreme poverty, but with a wealth of cultural heritage," he explains. The church in Lari was the first one targeted for restoration. Early Franciscan chroniclers described the site as a sacred indigenous center, Cavero notes, and their texts referred to the destruction of some 500 native objects. Restorer Juan Carlos Cavero Catalán points out design details at the entrance to the Lari church. Lari is perched on a shelf overlooking the Colca River, and the bell towers of its massive church are visible for miles against a landscape that is a palette of greens in the rainy season. Sometimes called the "Colca Cathedral" because of its monumental size, the 1758 structure had severely deteriorated due to time, the elements, and regular seismic activity, according to Cavero. In a pattern that would be repeated in Maca, Chivay, Ichupampa, Coporaque, Yanque—town after town on either side of the river—the AECID team brought in Spanish and Peruvian architects, structural engineers, art restorers, and other professionals. They also began to provide training so local young people could participate in the restoration. Each church has its own peculiarities and styles. In some cases, says Cavero, the interior may have been altered over the years, either by necessity, due to a fire, or because of a priest's decision to change with the times. The church in Maca, which was turned over to the community in its restored state in 2006, is one of the most important in the valley, Cavero says, because it is the only one that still has all of its elaborately carved wooden altarpieces, or retablos, intact. The church in Ichupampa, meanwhile, has the biggest collection of original paintings—21 canvases. 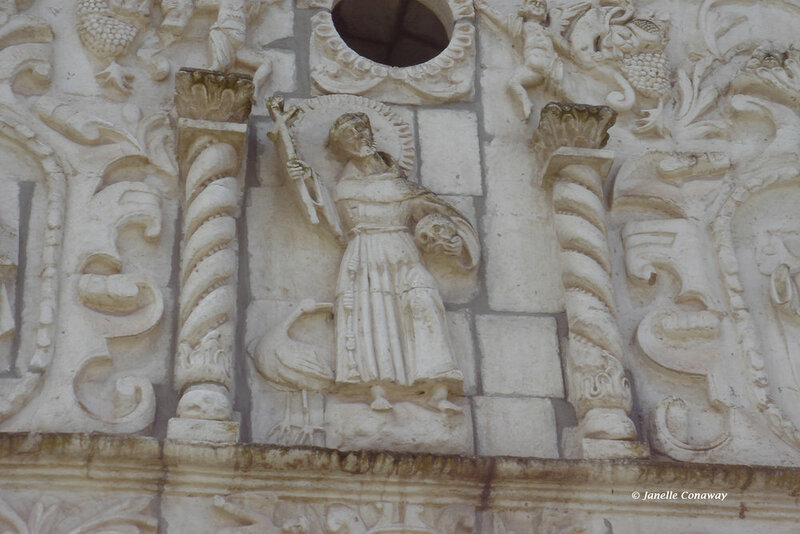 The ornate façade of the Yanque church is particularly distinctive, with its carved saints and Franciscan iconography. The Lari church, whose restoration was finished in 2003, is the only one in the series built in the shape of a cross, with transepts off the nave, and the only one with a cupola. It is also rich in murals. These survived largely intact because they had been whitewashed with lime—perhaps, Cavero says, to disinfect the walls in response to a major 18th-century epidemic. Restorers carefully removed the lime to unveil the hidden paintings. The mural restoration has included sealing and shoring up the sillar against future deterioration, using both local organic materials and special solvents imported from Europe. In cases in which a painting needed touching up, restorers applied lighter shades and more abstract strokes for the filled-in areas to deliberately distinguish them from the original portions. Only water-based pigments were used. For Cavero, who has spent more than a decade cataloguing and helping to restore the cultural heritage of the Colca Valley churches, the project has been gratifying both professionally and personally. Standing in the expanse of the Lari church, one minute he is pointing out a lovely altar sculpture of the Virgin of the Immaculate Conception, and the next he is describing the lively local festivities held throughout the year to express devotion to a particular patron saint. "You get to know people's identity, their way of life, their culture, and their traditions, and you share the heritage and customs of the community," he says of his work. The restoration of the churches had been scheduled to be completed in 2010, but has been extended at least through 2012. In the more than ten years since the project began, it has had a few setbacks, including the theft of embossed silver pieces from the altar in Yanque and minor damage at some churches from the 2001 Arequipa earthquake. But the work continues to move forward. The government-funded Spanish agency works in partnership with various Peruvian government institutions and, in the case of two of the churches still under restoration, with the nonprofit World Monuments Fund. The Project for Integral Development of the Cultural Heritage of the Colca, which has invested more than 300,000 euros per year in the valley, has moved well beyond church restoration, explains its director, José Carrión Carrillo. It has also been working to improve housing conditions in the area and has supported local officials in land-use planning, to help them take better control over local tourism development. The project has also sponsored training to revive and promote ancestral arts and crafts, including weaving, embroidery, and pottery. The Coporaque Cultural Center, scheduled to open in early 2012, will highlight music, dance, and other cultural aspects native to the Colca region. Since it began, the project has trained more than 400 young people in traditional construction, restoration, and other trades related to their cultural heritage. Lidia Ventura, who began learning the painstaking skills of art restoration in 1998, when she was 18, worked on sculptures and canvases from several of the local churches and later spent two years on a completely separate restoration project at a church in Arequipa. Recently, she was teaching local artisans how to make sculpted dolls, painted to display the colorful designs of local indigenous dress. The dolls, created for the tourism market, are made using techniques and materials developed by Ventura's Collagua ancestors. These same techniques and materials are used in some of the colonial church sculptures. Ventura says the training she acquired through the restoration project has given her a profession, as well as knowledge that she is passing along to her own children. She used to think of the local churches as "a place you went to pray and that's it," but now when she walks into her favorite, in Lari, she is overwhelmed by its grandeur and the beauty of its murals and paintings. "It was worth making the effort and restoring that temple," she says. "You can see what has been achieved." The 1758 church in Lari, the only one in the series built in the shape of a cross, is sometimes called the "Colca Cathedral" because of its monumental size.